Normally, on this blog, the focus is on agent-based modeling and GIS. However, I am not agnostic to other modeling approaches especially cellular automata (CA) modeling (which I have written about in the past). 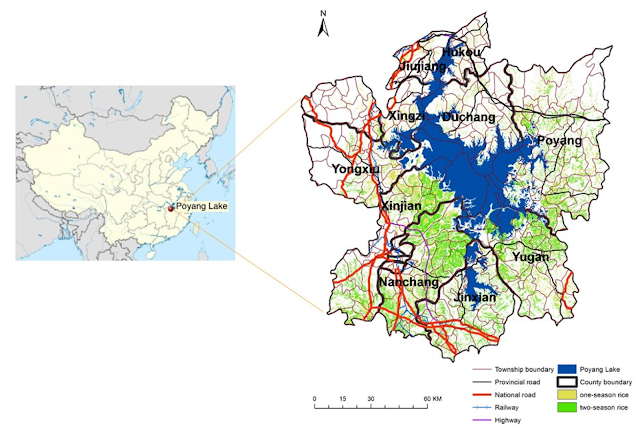 To this end, Rui Zhang, Qing Tian, Luguang Jiang, Shuhua Qi, Ruixin Yang and myself recently had a paper published in Land Use Policy entitled: “Projecting Cropping Patterns around Poyang Lake and Prioritizing Areas for Policy Intervention to Promote Rice: A Cellular Automata Model” In the paper we explore current land use patterns in the Poyang Lake Region (PLR) of China. Specifically, we focus on current rice production in the region and what this might look like in the future (especially the impact of farmland consolidation) by using an CA model (built on the DINAMICA EGO platform). Below you can read the abstract to our paper, along with some figures, outlining our study area, the model design and development, along with observed current day and predicted rice cropping patterns around Poyang Lake. Finally at the bottom of the post I provide the full reference and a link to the paper.